We offer a microwave oven testing service for checking leakage and electrical safety to complement our portable appliance testing work. This can be carried out at the same time as your PAT testing. We are able to test both domestic and commercial microwave ovens and provide services across the region including Reading, Thatcham, Newbury, Bracknell, Basingstoke, Wkingham, Ascot, Windsor, Guildford, Swindon and Slough. Although microwave ovens provide a convenient and safe way of cooking food in the workplace faults can occur and unless periodically tested they may become a health and safety hazard to you and your staff, or residents in the case of landlords, without you being aware. Lack of cleanliness and poor maintenance of the door seals can lead to leakage levels in excess of the recommended limit. 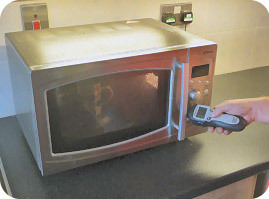 Microwave testing involves measurement of the radiation levels around the oven unit using specialist microwave detection equipment to ensure compliance with legal limits. The safety interlock switches and the door seals are inspected for any signs of damage to ensure that they function correctly and safety. Is it clean? Often users forget to wipe down the insides and door of a microwave after it’s been used. As well as obvious build up of food particles it can also build within less obvious places such as the ventilation grills. Does the door close properly? If it is damaged or has loose hinges, or if the seals are cracked or broken it may appear safe but it doesn’t necessarily mean it is. It’s important to bear in mind that the level of exposure to any leaked microwave radiation dramatically reduces as you move away from a microwave oven. Your regional microwave oven testing specialist. For microwave testing services in Reading, Thatcham, Newbury, Bracknell, Basingstoke, Wokingham, Maidenhead, Ascot, Windsor, Guildford, Swindon and Slough.